‘Tis the Season to be jolly! Holiday, parties fill the calendar this season. 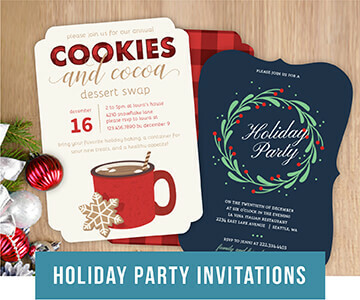 You’re bound to receive, lots of holiday party invitations, for , work parties, family parties, school parties, and any other club or organization you are affiliated with. It can make for a very busy time of year. So if you are planning a holiday party. 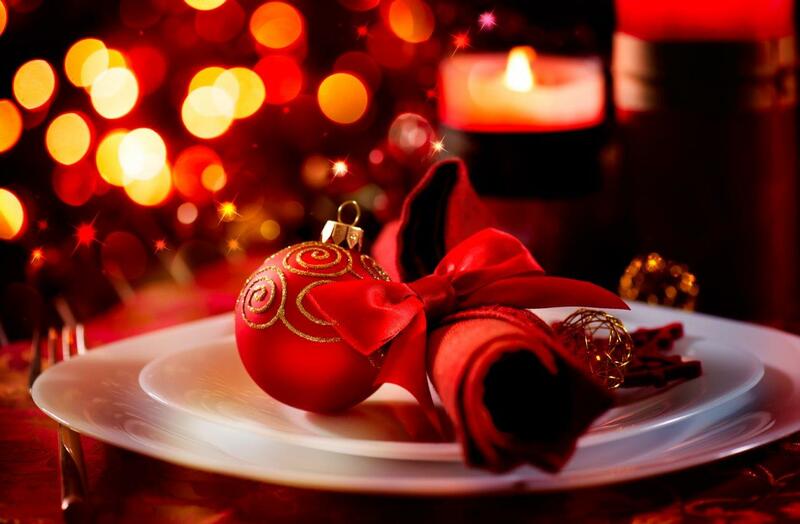 to help keep you stress free, this year, we have, some planning tips for your holiday soiree. Plan Early: It is important to plan ahead of time. The month of December can swell up like a tidal wave with all things to cram in. So it’s a good idea to take care of all the big things first (date, location, menu) and not worry about all the finishing details until the days before the big event. Set a Budget: This is really the key to any event planning success. 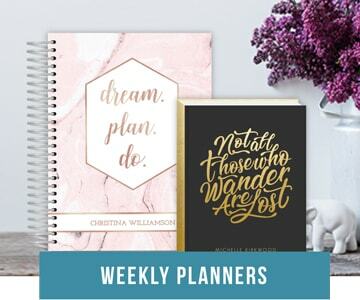 Plan your budget and stick to it. Be realistic. You don’t need brand new china to throw a fabulous party. Write down everything you definitely want to have and estimate a reasonable cost next to it. Include everything from chip dip to poinsettias. Always overprice when in doubt. If you think eggnog costs between $2.00 to $3.00 a box, mark it down as $3.00. This way, you won’t be caught without enough money at the store. After you’ve made up your list, total the cost of all your items, and add another 10% to the price. Don’t forget the paper napkins, flatware, and extra toilet paper you’ll need. Expect to spend about $75 on food and drink alone-more if you’re entertaining more than ten people, and a lot more if you’re planning to have a party where people might be consumed with merriment from large quantities of eggnog. When you finally go shopping, avoid buying anything that’s not on the list, unless it’s something important that you forgot. Impulse buys are the quickest way to kill your budget. Make a Guest list: Invite only the number of people that you can realistically handle. Remember this is not the only expense you’ll have this month. So don’t throw a shindig for 50 people if you can only afford to feed ten. Also take into account the size of your place and the fact that some of your guests will probably bring a friend or two without asking you. Choose a Date: Parties should be set on any Thursday, Friday, Saturday, or Sunday before Christmas or on Christmas Eve. Most people spend time with their families on Christmas Day, and after the 25th, everyone will be concentrating on New Year’s. 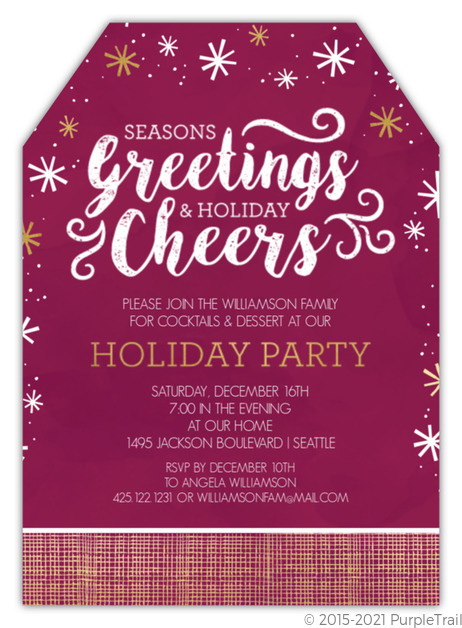 With, PurpleTrail holiday party invitations you can create fabulous online, print at home, or PurpleTrail, Print, invitations. Invitations: Send out invitations and send them out earlier than later. December gets booked up quickly for people. 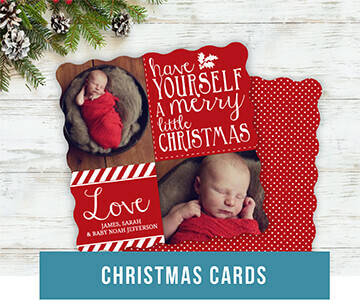 Browse our unique holiday invitations for inspiration. Invite everybody yourself (as opposed to asking someone to pass the message along to others) so that everyone at the party feels comfortable showing up. If it’s OK for your guests to bring dates or kids, indicate it on the invitations; otherwise ask your guests to alert you in advance about anybody they’re bringing. In either case, it’s good to suggest people respond with the total number of folks they are bringing. It’s not unreasonable for you to know how many people to expect and prepare for. Indicate how guests should dress for the party. Words like “causal” will indicate that jeans are OK, while words like “festive attire” will create a different set of expectations. Check out our Dress Code Guidelines article if you are not sure how to word your invitation. Some suggestions: deli platters, vegetable platters, crackers and cheese, seasonal fruits, and anything that you know you can cook well and in sizeable portions. If your budget allows it, consider having your party catered. That takes one big item off your hostess plate. Do shopping for non perishables a few days ahead. Buy all fresh ingredients the day before the party. Make ahead any dishes the recipes allows for 1-2 days ahead. Do your prep washing and cutting the night before the party to make additional day of food prep a little faster. Enlist family members to help clean the house a few days before the party so all you have to do the day of is light clean up. During the party, in an effort to contain the dirty dishes and keep them out of the way, have a wine box from your local wine or liquor store handy to put in all the glassware and a heavy duty office box to put the dishes in. Put pots and pans back in the cold oven and in the morning move everything to the dishwasher, put on soak and then wash. It’s what the caterers would do! And there you have it. Tips for an easy, stress-free holiday party. Enjoy yourself and have a happy holiday season!